New York Gov. Andrew Cuomo's formidable clean energy goals have entangled his administration directly in another issue -- the future of nuclear power in his state. The state Public Service Commission is searching for ways to channel financial support to as many as three existing nuclear plants on Lake Ontario to keep them from closing in the face of competition from cheap gas-fired generation. The proposal is due in June. Under the Democratic governor's plan, by 2030, New York intends to get half its energy from renewable power sources and reduce power plant greenhouse gas emissions by 40 percent from 1990 levels. The nuclear plants, with their carbon-free energy, are a vital bridge to the state's renewable energy goals, the PSC staff says. The three plants are the R.E. Ginna plant east of Rochester and the two-reactor Nine Mile Point plant, both operated by Exelon Corp., and Entergy Corp.'s single-reactor FitzPatrick plant, standing next to the Nine Mile Point units in Oswego, near Syracuse. They have a combined 3,345 megawatts of capacity, delivering about 15 percent of New York's in-state electricity generation. Without these nuclear units, New York would rely heavily on additional gas-fired generation, and carbon dioxide emissions would rise 27 percent, according to a study by the Brattle Group. New York Gov. Andrew Cuomo is searching for ways to channel financial support to as many as three upstate nuclear plants on Lake Ontario, including the Nine Mile Point plant, to keep them from closing in the face of competition from cheap gas-fired generation. Photo courtesy of Exelon Corp. The PSC, still negotiating a possible support deal with the nuclear plant owners, has not published an estimate of potential impact on ratepayers, but some consumer and environmental advocates are worried. "I have a lot of concerns about what the costs might be," said Michael Mager, counsel to Multiple Intervenors, a group of about 60 large industrial, commercial and institutional energy consumers, during a PSC conference on March 9. "Customers, through subsidies, are going to have to pay essentially the full operating costs of these units and also be on the hook for the units' risks and contingencies." "It's very unclear exactly how it would work. We don't know how much money yet, but we estimate it in the billions, and that should be spent ramping up renewable power faster," said Jessica Azulay, program director of the Alliance for a Green Economy in Syracuse. Replacing the nuclear plants' electric power with more renewable energy won't work in the short term, the PSC counters. Retirements of Ginna and FitzPatrick could require more than 5,000 MW of wind generation to produce the same amount of zero-carbon power, the PSC said. But the state has only added about 1,900 MW of wind power over the past decade through the renewable portfolio program, it said. While it tries to calculate a payment formula that meets the operators' needs and is fair to consumers at the same time, the PSC is also under pressure to find a different, faster-moving solution to keep the FitzPatrick plant from shutting down. The FitzPatrick plant was built and run originally by the New York Power Authority before Entergy bought it. That sale was a mistake that Cuomo and the Legislature need to correct by buying back the plant, says John T. Sullivan Jr., former chairman of the New York state Democratic Party and a former Oswego mayor. "New York state and Oswego County need the 600 good-paying jobs and the positive $70-plus million dollar impact of the FitzPatrick plant on the local and state economy," he said last year in a comment on Syracuse.com. Upstate political leaders continue to push for that outcome. Meanwhile, Entergy wants to take the issue in a different direction. Any rescue plan will come too late for FitzPatrick, it says. The company will close the plant this year rather than pay the $100 million cost of refueling the reactor. "Unfortunately, this proceeding is not going to do anything that will change the outcome for FitzPatrick," Entergy Vice President Michael Twomey said at the March conference. But Entergy insists that any state payments to nuclear plants must also go to its Indian Point plant on the Hudson River in Westchester County, a plant Cuomo wants to close based on its proximity to the New York metropolitan area. "We have every expectation that Indian Point will be included ultimately," Twomey said. "It would be arbitrary and improper to exclude Indian Point and, quite frankly, make New York's carbon reduction goals unattainable." Four U.S. nuclear plants have closed since 2012 through a combination of financial losses and major repair challenges, and Exelon says some of its Midwest plants are at risk of closing too. 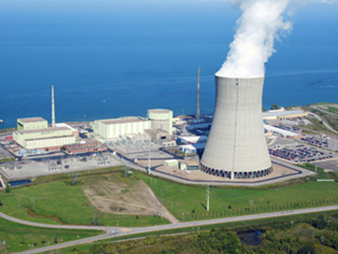 It has been seeking a state-supported plan in Illinois that would help put its nuclear plants there in the black (EnergyWire, Feb. 4). In New York, the PSC is in the throes of designing a payment stream for upstate nuclear plants. In its Jan. 25 "White Paper on Clean Energy Standard," the PSC proposed creating zero-emissions credits (ZECs) that power distribution utilities would have to acquire, or make offsetting compliance payments. The eligibility criteria set by the PSC would exclude Indian Point at present. There was plenty of debate among participants at the March PSC conference about how credits should be constructed and calculated. Twomey said the payments should be based on the value of the nuclear plants' carbon-free electricity, not pinned to costs and revenues from the plants' operations. "Instead of focusing on cost, the commission ought to be focused on the carbon reduction opportunity," he said. "In other words, it shouldn't matter what the costs are [or] what the revenues are of the facility. If your objective is to reduce carbon, then that should be the goal." If the plants close, every ton of carbon emissions that results will remain in the atmosphere for decades. "Our preference would be that there shouldn't be a cost or revenue analysis at all," he said. As outlined in January, the ZEC program would be based on the nuclear plants' historical costs and anticipated electricity prices, with a price cap to protect customers, the PSC staff said. Joseph Dominguez, executive vice president for policy at Exelon, said the company was ready to discuss revenue and cost details with the PSC to search for a credits program. He added later, "This is not a path that is easy to navigate." For example, how would the state's plan deal with a nuclear plant that received credits but then closed down prematurely because of a major equipment issue? Dominguez said that issue could be on the agenda. "We might consider conditions around continuing to operate these plants that are in jeopardy if we are allowed to participate in the ZEC program. That's something we're fully prepared to talk about," Dominguez said. Tim Judson, executive director of the Nuclear Information and Resource Service, a nuclear power opponent, raised another issue concerning a price cap on the credits to protect consumers. If it's true that the state can't meet its emissions goals without the nuclear plants -- and that hasn't been documented, he noted -- then how can the state enforce a price cap if that means the plants are going to close? "That seems to be an inherent conflict." The conflict remains in the PSC's lap. Commission Chairwoman Audrey Zibelman closed the March conference by acknowledging the multiple forces pulling on the agency. "We have the finger on the scales on many items. Clean energy is certainly one. Energy affordability is another," she said, adding reliability to the list. "We are very interested in how to hit our complex of goals," she said.